KitMonsters – Lea Lea. The music makers’ guide to making music. 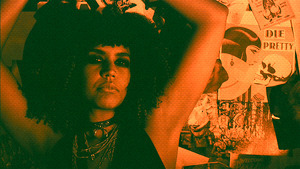 Lea Lea’s back with a fabulous earful of fierce - the anthemic single ‘Chasing Paradise’ from her EP ‘Die Pretty Vol II’. She’s playing Glastonbury Festival, has been selected as a BBC Introducing ‘Artist To Watch’, receiving radio support from BBC Radio 1 and 6 Music and attention from Noisey, AfroPunk, Red Bull Music and more for her signature pop-rock sound. When she isn’t making her own music, she is touring and writing with dance/pop-punk band Chk Chk Chk (!!! 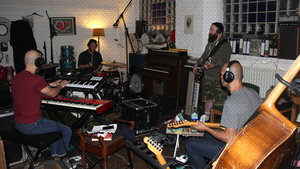 ), working with members of Friendly Fires, Crystal Fighters, and writing for other projects. We talked to her about the new release, her label and more. Lea Lea blasted her way into people’s consciousness with her thrilling voice - her debut album drew comparisons to MIA and Kelis, and put her on the BBC Introducing ‘Artist To Watch’ list. Her new single, ‘Chasing Paradise’, is taken from her upcoming EP ‘Die Pretty Vol.ll’. It’s a huge hook-laden track with vocals that will sear themselves into your ears. 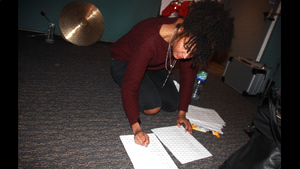 Lea Lea has been honing her sound with the help of writing/record label partner Kim Garrett (Gothic Luau), producer Jack Baker (Bonobo, Alice Russell) and Chris ‘Fattybassman’ Hargreaves (Alex Claire, Submotion Orchestra). We asked her to tell us more about the new EP. This is the powerful first single from your new EP, tell us what it’s about. I was drinking with my songwriting partner Kim Garrett and we started daydreaming about what we’d do with the very simple notion of having a whole day off (which is pretty novel these days). It started with the simple things of what we’d eat and drink and what a day of freedom meant to us. It quickly though became a discussion about what it means to have full liberation for women. This is how ‘Chasing Paradise’ came about, it’s a song about taking the reins and seizing the day. From daily struggles to inequality, this song is a mantra of freedom. Giving two fingers to the establishment and always chasing your own personal paradise. How was the EP written and recorded? This EP was written and recorded much like ‘Die Pretty Vol. l’. It usually starts with Kim and I drinking Tequila, talking about politics, inequality, relationships, fun nights out, what makes us piss our pants with laughter and also what brings tears to our eyes. For this EP I wanted to explore the idea of complete freedom and what it meant to me as a women and as a human. My band and I headed up to Leeds to record at the wonderful Greenmount studio. Like the first EP we kept it raw, hit record and played all takes together with minimal overdubs. 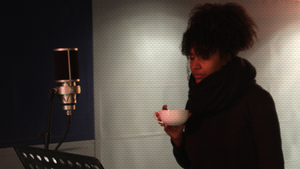 I think there’s a magic about going back to basics and recording this way. With the concept of freedom being the content focus; I also wanted that to be apparent in the sound so there’s a lot of free style guitar and vocal moments to add to the psychedelia. You’re running your own record label, what does that mean for you as an artist? Complete freedom. I like the idea of being involved with every aspect of creativity and also business. Creating Gothic Luau meant I got to do that. The idea of working hard for years on a record just to give it away to an exec with their own business vision makes me uncomfortable. The music world is so dominated by men and I felt a responsibility to help even the score by collaborating with some amazingly talented women (Kim Garrett and Lia Nicholls) to create Gothic Luau. Pretty excited for all our upcoming projects! Well I get to wear hotpants, sing and dance like I’m on acid every night while on tour so I’d say it’s pretty awesome. They’re a lovely bunch that are full of wisdom and open to ideas too. Feel very honoured to perform with them and excited for our album to drop this year! The year began with launching my label Gothic Luau and we’ll be releasing the single on 17th Feb with the EP ‘Die Pretty Vol.ll’ to follow on 3rd March. My big label/EP launch is also on the 2nd March at The Old Blue Last! The rest of the year I’ll be touring my solo project as well as the new !!! 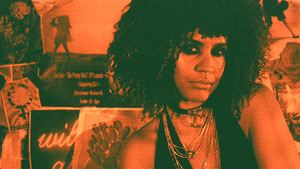 album, finishing a project with Edd from Friendly Fires and also introducing an upcoming Gothic Luau fashion line. 2017 is going to be hectic! 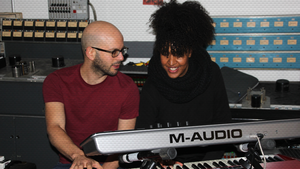 Read more about Lea Lea’s vocals, recording process, and music gear here. 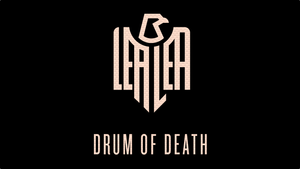 We’re loving Drum of Death, what a huge sound, is that a sign of what the whole EP is like? The dynamics vary but the whole EP is pretty energetic; in the studio I really wanted to create that vibe of watching a live band rock out on stage and allow those natural live performance elements (feedback, no overdubs) to stay in the recording. I think it really brought life to the EP as a whole. How would you describe your sound and your philosophy/attitude? The approach I apply to my music and life as a whole is do what makes you happy, you can’t allow fear to rule decisions. It might sound super simple but I think it’s a lot harder in practice. At first I wondered if changing sounds from my first album (Electronic) to this EP (Rock/Pop) was a bad idea - genre shifting can be considered risky. I decided to do what I wanted anyway as changing it up was what would make me happy, no regrets! Your voice is really distinctive, has it always been like that or have you developed your style? I think my voice is the product of a lot of Tequila drinking and late nights! My responsible side would also add that I’ve been inspired by an array of singers also; from Stevie Nicks to Jimi Hendrix, Prince, Robert Plant, Pavarotti, Otis Redding, Brody Dalle and so many more. I think the one thing they all have in common is a distinct voice and a ton of character - that’s definitely something I’ve been aiming for. How do you write your songs, from first steps through to demo-ing? There’s no real linear direction when I write songs; when I’m writing for others you have to consider other team members co-writing so in that instance there’s definitely not a specific way. I write a lot of my songs with song writer and business partner Kim Garrett and a lot of what we write about is based on our travels and stories, we usually head to a bar to lyrically formulate our song ideas. Generally speaking, writing for myself I’ll either have lyrics to begin with or a melody. From there I’ll organise the demo and put together a rough production; I’ll then enlist the team who’ll then transform my sketchy bass lines and drum beats into something more solid. What music gear do you use and why? Currently I’m studying sound engineering and using Pro Tools to record - I’ve always been interested in understanding the science behind sound. I’ve got a little home studio that includes a piano, bass guitar and percussion - my essentials and the skeleton for the song writing process. My bass is a white vintage Jazz Squier Fender; I call him Barry White. I own an upright Boosey & Co vintage piano also. How do you record your songs? Is it all done in a studio, or do you record some parts yourself? I record demos at home but I record final edits in the studio. I recorded the EP over 3 days at the best studio in Leeds. 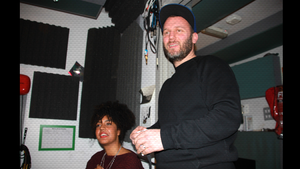 It’s called Greenmount Studios and is run by the legends that are Lee and Jamie. For me the studio is a place where everyone should be able to express ideas freely - I think that’s where you can truly create something that’s awesome. It’s also important to have someone oversee the project as a whole - that person is my producer Jack Baker. He absolutely gets my vision and has the ability to decide what’s best for the song. We’re always experimenting in the studio, from different recording techniques to adding a Ragga infused beat in Drum Of Death which is mainly considered a Rock song. I think experimenting with sound and genres is the most exciting part of the recording process; it can either go horribly wrong or give life to a whole new, weird sound. Either way it’s pretty fun! One of the things that makes Drums of Death so exciting is the big mix of sounds, dance, pop, even punk. What are your musical influences? I think my love of mix matching comes through very strong in “Drum Of Death”. Lyrically I wanted it to drive a powerful message home - we are all equal in death. I think in that regard the Punk feel comes through and it’s what I love about the Punk genre, it’s unapologetic about the message it’s delivering. I’m guilty of loving Pop too and grew up listening to a lot of it. With its catchy hooks and singalong approach it’s an element I definitely wanted for this EP. As a kid my parents played an array of different genres; I think my music is pretty much an ode to the soundtrack of my childhood. 2016 has begun and it’s already hectic! Kim and I have launched our label, Gothic Luau and we’ll be releasing the EP through it which comes out 19th Feb. I’ll be performing the EP tracks live for the first time at my launch on the 17th Feb at Birthdays! Then I’m back on the road with Chk Chk Chk for their European tour, then in June my 2nd EP is released and the rest of the year I’ll be touring. I’m also hoping to make time to read, travel, party, study, do more for the greater good and write more this year also!